As 2017 ticks to a close most of the weather and wave action will be happening on the western side of the country, and the trend continues into 2018. Large swells are expected to build on Monday along the western shoreline, also most of the rain affecting New Zealand is coming in from the Tasman Sea, with heavy falls in the west. A Southern Ocean swell is forecast to arrive along the west coast during New Year’s Day. 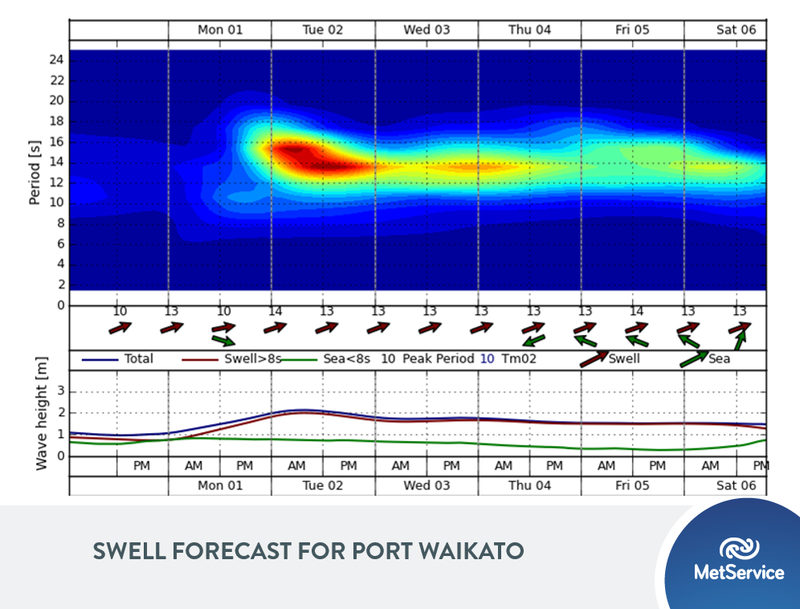 Long period swell waves will begin to arrive late tonight in the South Island and early tomorrow in the North Island. A rapid increase in wave height is expected, and marine users are urged to be aware of the changing conditions. 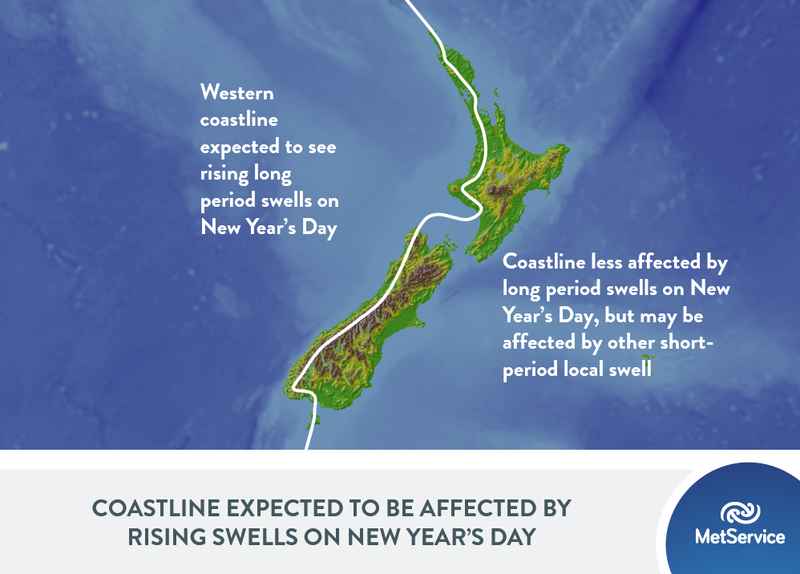 People planning a west coast swim on New Year’s Day are advised to find a patrolled beach, and that rock ledge fishing and bar crossing by boat may become hazardous. Surfers however, will be delighted by this first swell of 2018, which is forecast to provide very good surfing conditions. Significant wave heights of up to 3 metres and at 14 second peak period are predicted for Tuesday, easing to around 2 metres for Wednesday through Saturday. Unlike the distant origins of the swell, local weather conditions are being driven by a tongue of humid air which stretches over the country from the Tasman Sea. This means heavy rain in the west of the South Island – with 134mm recorded at Milford Sound airport between 11am Saturday and 11am Sunday – and showers developing during New Year’s Eve for western parts of the North Island. Eastern and inland areas of the North Island should stay dry, although a southerly will bring brief rain to eastern parts of the South Island. Wanaka will see a few afternoon showers, but this should clear in the evening leaving dry weather for the changing of the year at Rhythm and Alps. The warm tongue sticks around through the first week of 2018, bringing further rain to the west and a few thunderstorms to the Central North Island particularly on Tuesday. Towards the end of the week a significant low will develop on the tongue and track across the North Island, which is expected to bring significant rain with it.